I get more than a dozen emails, tweets, or phone calls every summer like this. Excited (terrified?) correspondence asking about the “giant” mosquito captured in the backyard or buzzing about windows. Toxorhynchites speciosus is as “good” a mosquito as there can be. First, it is a gorgeous creature. Almost four times the size of a typical mosquito, it is a large dark and shiny mosquito with bright metallic patterns. There are around 70 species of Toxorhynchites mosquitoes around the world but only a few species found in Australia. The mosquito is reasonably common, but rarely very abundant. It is found along the eastern and north coast of Australia, stretching from Sydney through to Darwin. This is one of the few mosquitoes that don’t need blood. Unlike almost all other mosquitoes, the females of which need blood to develop their eggs, Toxorhynchites speciosus doesn’t bite. It gets its energy from plant juices and nectar. Even though it doesn’t bite, the sheer size of this mosquito makes it an imposing sight. They most commonly lay eggs in water holding containers around the home. Pot plant saucers, bird baths, watering cans, buckets, bins and even tree holes and water-filled bromeliads. These are the same types of water-filled containers where you’ll find wrigglers of the pest mosquitoes Aedes notoscriptus and Culex quinquefasciatus. They have a fascinating way of laying eggs. Unlike many other mosquitoes that elegantly stand on the water surface and lay up to 300 eggs in a neatly packed floating raft, Toxorhynchites lays single eggs. It doesn’t even land on the water to lay eggs, it fires them into water while in mid flight! Once an appropriate place to deposit an egg has been identified, the mosquito flies in a vertical loop, the loops getting ever smaller until the egg is ejected and into nearby habitats. A neat trick and avoids the risk of being eaten by a hungry spider or other predator waiting by to grab a mosquito coming in to lay eggs. Not only do these mosquitoes not bite, they even help out with a little pest mosquito control around the home. While the mosquito wrigglers of mosquito mosquitoes feed on organic debris floating about in water bodies, the larvae of Toxorhynchites speciosus are predatory and feed on the wrigglers of other mosquitoes. Laboratory studies have shown that a closely related Toxorhnychites consumed over 300 Aedes aegypti (aka the dengue mosquito) larvae during its development. In some parts of the world, a closely related mosquito is used as a biological control agent of the pests that spread dengue, chikungunya and Zika viruses. While Toxorhynchites speciosus will chomp through plenty of wrigglers of Aedes notoscriptus each summer in Australian backyards, it is unlikely to make a huge difference in bites. My experience in backyards across Sydney has shown that there is something of a tug-o-war between Toxorhynchites speciosus and other mosquitoes. While undertaking a project with Ku-ring-gai Council looking at backyard mosquitoes and their possible impact on backyard wildlife conservation efforts, I’d often find a fluctuating dynamic between the mosquito predators and their prey. Populations of Aedes notoscriptus or Culex quinquefasciatus would build up in bird baths and buckets, then Toxorhynchites speciosus would move in. They’re eat through all the other larvae, then once emerged and flown off, the other mosquitoes would move back in. And the cycle continued. Image of Toxorhynchites speciosus sent to be by David Lawson from the inner west suburbs of Marrickville, Sydney. Next time you see a “giant mozzie” buzz by, think twice before you squish it. Oh, and keep in mind that this mosquito is also a movie star! Do you recognise it from Jurassic Park? If you want to keep the pest mosquitoes out of your backyard, make sure you get rid of any water-holding containers. If you can’t throw them out, keep them covered. Check to make sure your roof gutters and drains are clear of leaves and other debris so they flow freely. Check your rainwater tank is screened to stop the mozzies entering. And try not to kill the good guys who help keep the other mozzies at bay! For more on how to better control insect pests in and around the home, read one of our latest publications on engaging urban stakeholders in the sustainable management of arthropod pests. Find out more about Australia’s fascinating mosquitoes by checking out our “A Guide to Mosquitoes of Australia” via CSIRO Publishing! While Australia has hundreds of “home-grown” mosquitoes, it is just a few from overseas that have authorities on alert. Preparing for these new risks is critical if the future pest and public health risks associated with mosquitoes are to be effectively managed. Citizen scientists may hold the key to success! A project underway in the Northern Rivers region of NSW is set to build a framework for responding to the threats of exotic mosquitoes. This is in association with the Building Resilience to Climate Change program, a partnership program between Local Government NSW (LGNSW) and the NSW Office of Environment and Heritage (OEH) to address identified climate change risks and vulnerabilities facing NSW councils. Lead by Tweed Shire Council, the program “Developing and trialing a Northern Rivers Emerging Vector Response Plan” is designed to build capacity among local stakeholders in the region to better respond to possible introductions of exotic mosquitoes from overseas (or perhaps travelling south from Queensland). The mosquitoes that pose the greatest risk are Aedes aegypti and Aedes albopictus. As well as being severe nuisance-biting pests, these mosquitoes can transmit pathogens of serious public health concern such as Zika, dengue and chikungunya viruses. The mosquitoes aren’t found in local wetlands, they prefer backyard water-holding containers. This means that should these mosquitoes make their way to NSW, local authorities must shift their focus from the swamps to the suburbs. There is already a program in place monitoring mosquitoes and the pathogens they carry in NSW. This program is primarily focused on Ross River virus and the mosquitoes that transmit this pathogen. As a consequence, mosquito collections are typically in bushland or wetland areas adjacent to urban areas and may not readily pick up exotic mosquitoes that have moved into local backyards. Authorities must expand their approach and develop strategic responses to these exotic threats. Representatives of local stakeholders help survey 300 backyards in Tweed Heads! This work is already underway. A workshop for local stakeholders was held in December 2017 in Tweed Heads along with a two day field exercise in which around 300 residential backyards were surveyed for potential mosquito habitats. A wide range of potential sources of mosquitoes was identified, the most common were water-filled plants (particularly bromeliads), pot-plant saucers, buckets, wheel burrows, garden ornaments, and rainwater tanks. The survey highlighted how important community involvement in the program is and “citizen science” is currently being employed to assess some mosquito surveillance technologies in backyards across the Tweed Heads region. Supported by a grant from the Human Health and Social Impacts Node, a partnership between the Office of Environment and Heritage, NSW Health and The University of Sydney, over 150 mosquito traps were deployed and it is hoped that the mosquitoes they collect will help inform the development of strategic mosquito surveillance in the future. Whats needed now is a better understanding of how the community thinks about mosquitoes and how they’re trying to make their backyard less favourable for these pests. Residents in the Local Government Areas of Tweed, Byron, Ballina, Richmond Valley, Clarence Valley, Lismore and Kyogle are invited to participate in a short survey. It is a great way to learn how to reduce the risks of mosquito bites in your backyard (there is also an iPad that can be won!). If you live in the areas mentioned, or know friends or family who do, please complete and/or share the details of the survey. You can start the survey now! There are many factors contributing to the future threat of mosquitoes and mosquito-borne disease in Australia. Climate change or exotic mosquito introductions may be game changes but one of the most important considerations is the importance of community awareness and willingness to assist local health authorities. Perhaps the new mosquito emoji will help too? Mosquito surveillance has been a critical component of how health authorities manage the risk of mosquito-borne disease. Data on the abundance and diversity of mosquitoes, together with activity of mosquito-borne pathogens, can guide decisions on when and how to apply mosquito control agents or issue public health warnings. Almost every state and territory in Australia conducts seasonal mosquito surveillance. The exceptions are Tasmania and ACT, although both have had some limited investigations over the years. Even among those doing routine surveillance, the program structure varies but most include the collection of mosquitoes. This is how we can determine if it really is “the worst mosquito season ever”! The programs are currently are working well in providing early warnings of outbreaks of mosquito-borne disease. These programs often include mosquito trapping undertaken by local governments and, occasionally, members of the public. For may years there has been a strong interest in citizen scientists undertaking mosquito sampling, particularly by some schools. The projects that I’ve been involved with have rarely got off the ground for various reasons. School holidays at the peak of mosquito season doesn’t help. Beyond that, the consumable costs of the traps we use, especially the dry-ice (carbon dioxide) used to bait the traps, can be a barrier to involvement. Dry-ice use in schools, and the associated health and safety issues, has been a cause for concern too. Finally, the fact that mosquitoes may be attracted to traps operated in school or community grounds and that these mosquitoes may be carrying disease-causing pathogens can often raise concerns. As a result, there really haven’t been any major citizen science based mosquito surveillance programs until recently. Things are changing. There are many reasons why citizen science is starting to come into play when it comes to mosquito surveillance more broadly. Technology is getting better (as highlighted by many smartphone apps) but also, some of the laboratory techniques are getting cheaper. This is a really critical issue. A breakthrough in rapid testing of mosquitoes led to the development of an award winning initiative in Brisbane by Metro South Health and Queensland Health Forensic & Scientific Services. The Zika Mozzie Seeker project combines this new laboratory technique with DIY mosquito traps by the general public to help track exotic mosquitoes. In short, residents create their own mosquito trap out of a bucket or recycled plastic container, it is filled with water and placed in a yard with a small piece of paper hung inside. Mosquitoes then drop by to lay eggs on the paper. After a couple of weeks, the traps are collected and egg filled paper strips sent to the lab and tested to track the DNA of local and exotic mosquitoes. The project has been an amazing success with around 2,000 participants being involved in recent years (that adds up to about 150,000 mosquito eggs collected and tested). Luckily, no exotic mosquitoes have been detected. But when it comes to citizen science based projects, perhaps it isn’t the mosquitoes collected (the backyard mosquito battles are fun to track though) but the awareness raised that is important. Awareness not only of the risks posed by mosquitoes, but what you can do about them through the safe and effective use of mosquito repellents and other personal protection measures. Engaging the public through citizen science may be the way to go. It doesn’t always work in reaching new audiences, as was discovered in a mosquito surveillance project in South Australia, but that doesn’t mean it won’t! The new initiative, launched under the name ‘Global Mosquito Alert’, brings together thousands of scientists and volunteers from around the world to track and control mosquito borne viruses, including Zika, yellow fever, chikungunya, dengue, malaria and the West Nile virus. It is the first global platform dedicated to citizen science techniques to tackle the monitoring of mosquito populations. The programme is expected to move forward as a collaboration involving the European, Australian and American Citizen Science Associations as well as the developing citizen science community in Southeast Asia. With such momentum, it is an exciting time to consider the potential of citizen science in Australian mosquito surveillance programs. This is what i will be exploring in my presentation at the Australian Citizen Science Conference in Adelaide this week. Mosquito-borne diseases are pervasive public health concerns on a global scale. Strategic management of risk requires well-designed surveillance programs, typically coordinated by local health authorities, for both endemic and exotic mosquitoes as well as the pathogens that they may transmit. There is great potential to utilise citizen science to expand the reach of current surveillance programs, particularly those centred on urban areas. There is increasing focus internationally on the role of citizen science in mosquito surveillance as evidenced by the establishment of the ‘Global Mosquito Alert’ project driven by multiple international stakeholders and citizen science associations. In Australia, new initiatives to engage the public in mosquito surveillance are emerging in multiple centres; utilizing a range of emerging field and laboratory technologies that remove previously existing barriers to community involvement. 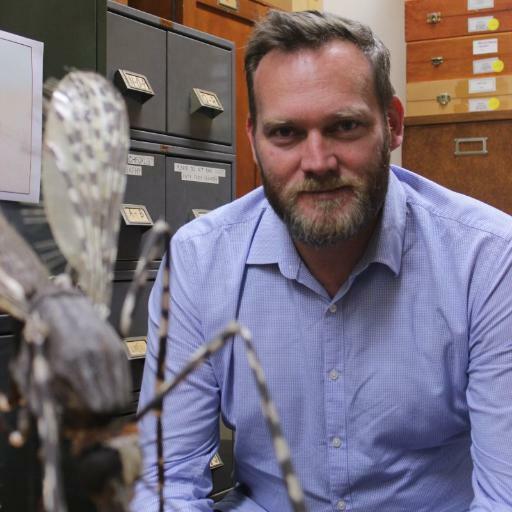 In South Australia, citizen science entomology programs have been trialed, and mosquito trapping and identification technology to expand existing trapping networks has been assessed. In suburban South-East Queensland, Zika Mozzie Seeker is linking citizen scientists into a network by using new laboratory techniques to rapidly screen for Ae. aegypti DNA in large numbers of eggs collected from DIY ovitraps,. In NSW, citizen science is being used to promote biodiversity and delineate pest and non-pest activity of mosquitoes associated with urban wetlands and surrounding suburbs. Citizen science holds great potential for public engagement activities as well as serving to enhance existing surveillance operations. Why do mosquitoes seem to bite some people more? Back in 2015, I had an article published at The Conversation on why some people are more likely to be bitten by mosquitoes than others. It is one of the most commonly asked questions I get whenever I give public talks (or friends and family are quizzing me at summer BBQs). This article was incredibly successful and has currently been read by approximately 1.4 million people. That is a lot of people. Hopefully the science of mosquito bites has got out there and actually helped a few people stop themselves or their family being bitten by mosquitoes! There’s always one in a crowd, a sort of harbinger of the oncoming mosquito onslaught: a person mosquitoes seem to target more than others. What is it about these unlucky chosen few that makes them mosquito magnets? There are hundreds of mosquito species and they all have slightly different preferences when it comes to what or who they bite. But only females bite; they need a nutritional hit to develop eggs. Mosquitoes are stimulated by a number of factors when seeking out a blood meal. Initially, they’re attracted by the carbon dioxide we exhale. Body heat is probably important too, but once the mosquito gets closer, she will respond to the smell of a potential blood source’s skin. Studies have suggested blood type (particularly type O), pregnancy and beer drinking all make you marginally more attractive to mosquitoes. But most of this research uses only one mosquito species. Switch to another species and the results are likely to be different. There are up to 400 chemical compounds on human skin that could play a role in attracting (and perhaps repulsing) mosquitoes. This smelly mix, produced by bacteria living on our skin and exuded in sweat, varies from person to person and is likely to explain why there is substantial variation in how many mozzies we attract. Genetics probably plays the biggest role in this, but a little of it may be down to diet or physiology. One of the best studied substances contained in sweat is lactic acid. Research shows it’s a key mosquito attractant, particularly for human-biting species such as Aedes aegypti. This should act as fair warning against exercising close to wetlands; a hot and sweaty body is probably the “pick of the bunch” for a hungry mosquito! Probably the most famous study about their biting habits demonstrated that the mosquitoes that spread malaria (Anopheles gambiae) are attracted to Limburger cheese. The bacteria that gives this cheese its distinctive aroma is closely related to germs living between our toes. That explains why these mosquitoes are attracted to smelly feet. But when another mosquito (such as Aedes aegypti) is exposed to the same cheese, the phenomenon is not repeated. This difference between mosquitoes highlights the difficulty of studying their biting behaviours. Even pathogens such as malaria may make us more attractive to mosquitoes once we’re infected. Only females bite because they need a nutritional hit to develop eggs. Researchers are trying to unscramble the irresistible smelly cocktails on the skins of “mosquito magnets”. But the bad news is that if you’re one of these people, there isn’t much you can do about it other than wearing insect repellents. The good news is that you may one day help isolate a substance, or mixes of substances, that will help them find the perfect lure to use in mosquito traps. We could all then possibly say goodbye to topical insect repellents altogether. Sometimes, it’s not the bite as much as the reaction that raises concerns. Think of the last time the mosquito magnets in your circle of friends started complaining about being bitten after the event where the purported mosquito feast took place. At least, they appear to have attracted more than the “bite free” people who were also at the picnic, or concert or whatever. But just because some people didn’t react to mosquito bites, doesn’t mean they weren’t bitten. Just as we do with a range of environmental, chemical or food allergens, we all differ in our reaction to the saliva mosquitoes spit while feeding. People who don’t react badly to mosquito bites may think they haven’t been bitten when they’ve actually been bitten as much as their itchy friends. 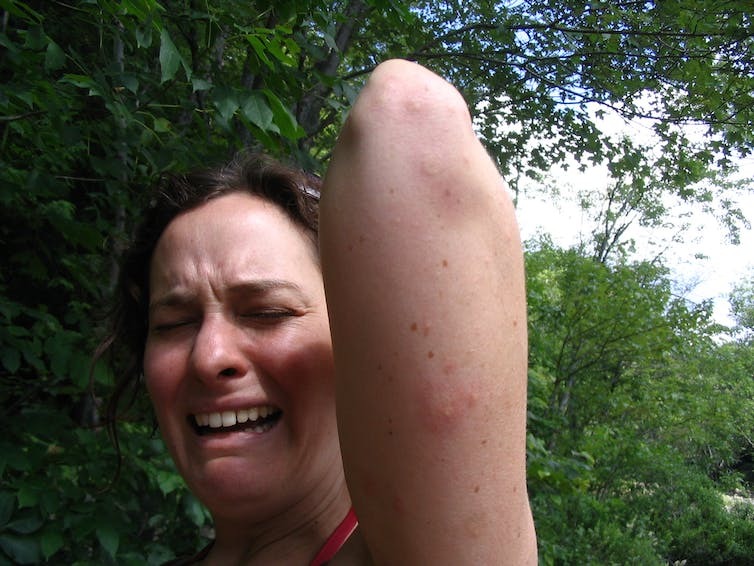 In fact, while some people attract more mosquito bites than others, there’s unlikely to be anyone who never, ever, gets bitten. The problem is that people who don’t react to mosquito bites may all too easily become complacent. If you’re one of them, remember that it only takes one bite to contract a mosquito-borne disease. Finally, there is no evidence from anywhere in the world that there is something you can eat or drink that will stop you being bitten by mosquitoes. No, not even eating garlic, or swallowing vitamin B supplements. Perhaps if we spent as much time thinking about how to choose and use mosquito repellents as we do about why mosquitoes bite our friends and family less than us, there’d be fewer bites all around. Posted in Scientific Writing	| Tagged Aedes aegypti, Aedes albopictus, Aedes notoscriptus, Aedes vigilax, blogging, Culex annulirostris, culex molestus, Culex pipiens, DEET, health, health tips, how do I stop mosquitoes in my backyard, insect repellents, mosquito, mosquito bite prevention, mosquito bites, mosquito coil, mosquito control, mosquito repellent, mosquito repellent band, mosquito repellent wrist band, mosquito repellents, Mosquitoes, mozzie, natural mosquito repellents, picaridin, repellents, science, Why do I get bitten by so many mosquitoes?, why do mosquitoes bite me?, Why do mosquitoes bite? This week I’ve been on the Gold Coast for the 12th Mosquito Control Association of Australia and Arbovirus Research in Australia Symposium. The theme of the meeting was “Managing challenges and threats with new technology” and included presentations covering a range of topics, from remote piloted aircraft for mosquito control to the discovery of insect-specific viruses and their potential to stop outbreaks of mosquito-borne disease. You can check out some of the tweets shared during the meeting here. I found myself on ten papers presented at the meeting and I’ve provided the abstracts below! Does surrounding land use influence the mosquito populations of urban mangroves? Mosquitoes associated with mangrove habitats pose a pest and public health risk. These habitats in urban environments are also threatened by urbanisation and climate change. As a consequence, urban mangrove management must strike a balance between environmental conservation and minimising public health risks. Land use may play a key role in shaping the mosquito community within urban mangroves through either species spillover or altering the abundance of mosquitoes associated with the mangrove. In this study, we explore the impact of land use within 500m of urban mangroves on the abundance and diversity of adult mosquito populations. Carbon dioxide baited traps were used to sample host-seeking female mosquitoes around nine mangrove forest sites along the Parramatta River, Sydney, Australia. Specimens were identified to species and for each site, mosquito species abundance, species richness and diversity were calculated and were analyzed in linear mixed effects models. We found that the percentage of residential land and bushland in the surrounding area had a negative effect on mosquito abundance and species richness. Conversely, the amount of mangrove had a significant positive effect on mosquito abundance, and the amount of industrial land had a significant positive effect on species richness. These results demonstrate the need for site-specific investigations of mosquito communities to assist local authorities develop policies for urban development and wetland rehabilitation. Do urban wetlands increase mosquito-related public health risks? Wetlands in urban areas are frequently constructed or rehabilitated to improve stormwater quality and downstream aquatic health. In addition to improving water quality, these wetlands can provide aesthetic, recreational and biodiversity values to communities. However, urban wetlands are often perceived to proliferate nuisance-biting and pathogen-transmitting mosquitoes which can, in severe cases, erode goodwill in the community for protecting these valuable ecosystems. We compared mosquito assemblages at 24 natural and constructed wetlands in the greater Sydney region, Australia. Our aims were to determine if wetlands with high aquatic biodiversity posed reduced mosquito-related public health risks, and if these links vary across the urban-rural gradient. At each wetland we sampled adult and larval mosquitoes, aquatic macroinvertebrates and physical habitat variables on two occasions through summer and autumn. Although larval mosquito abundance was low across all sites, there was a high diversity of adult mosquito species, and assemblages varied greatly between sites and seasons. Species of wetland-inhabiting mosquitoes showed vastly different responses to aquatic biodiversity and physical habitat variables. There were strong relationships between the abundance of some mosquito species and aquatic macroinvertebrate richness, while others mosquito species showed strong relationships with the percentage of urbanisation surrounding the wetland. Effectively integrating wetlands into cities requires balancing wetland design for water infrastructure purposes, biodiversity resources and public health and wellbeing requirements. Understanding relationships between biodiversity value and mosquito-related public health risks will enhance the value of constructed urban wetlands in cities while minimising risks posed by mosquitoes. Despite a huge increase in the detections of exotic vectors at ports around Australia, up until 2016 there had been no detection of Aedes aegypti at the Sydney International Airport. However, this changed on 14/Jan/2016 when two larvae were observed in an ovitrap serviced by the Department of Agriculture and Water Resources (formerly AQIS), as part of their routine surveillance activities for the detection of exotic vectors. These larvae were confirmed as being Ae. aegypti. Thereafter, there were a further nine separate detections of Ae. aegypti up until 4/Mar/2016. Six were via BG traps, one in an ovitrap, and there were two separate instances of an adult mosquito being collected in open areas. The majority of detections occurred in areas of the airport known as the ‘basement areas’. This is where the bags are unloaded from the air cans onto convey belts for collection directly upstairs by the passengers. Response measures undertaken included: (1) enhanced surveillance; BG traps were increased in number from 2 to 12, and traps inspected at more frequent intervals; (2) insecticide treatments; thermal fogging and surface sprays were conducted of the relevant areas; (3) vector surveys; a comprehensive audit of the airport was undertaken to examine the potential for localized mosquito breeding. In the case of the vector surveys, some 107 potential sites were identified and grouped into risk categories. No Ae. aegypti were discovered breeding, although Cx. quinquefasciatus and Ae. notoscriptus were found, and recommendations to prevent future localized breeding were made. Mosquito-borne disease management in Australia faces challenges on many fronts. Many gaps exist in our understanding of the drivers of exotic and endemic mosquito-borne disease risk but also the pathways to ensuring the community embrace personal protection measures to avoid mosquito bites. While traditional media has been the mainstay of public health communications by local authorities, social media provides a new avenues for disseminating information and engaging with the wider community. This presentation will share some insights into how the use of social media has connected new and old communications strategies to not only extend the reach of public health messages but also provide an opportunity to promote entomological research and wetland conservation. A range of social media platforms, including Twitter, Instagram and WordPress, were employed to disseminate public health messages and engage the community and traditional media outlets. Engagement with the accounts of traditional media (e.g. radio, print, television, online) was found to be the main route to increased exposure and, subsequently, to increased access of public health information online. With the increasing accessibility of the community to online resources via smartphones, researchers and public health advocates must develop strategies to effectively use social media. Many people now turn to social media as a source of news and information and those in the field of public health, as well as entomological research more generally, must take advantage of these new opportunities. So, you want to write a field guide? We know a lot about Australian mosquitoes. They’re one of the most studied insects in the country. Their pest and public health threats warrant a better understanding of their biology and ecology. There is still plenty we don’t know. We may not understand their ecological role in the local environment very well and there are many mosquitoes we know exist but have very little information about them. We still need to give many mosquitoes a formal scientific name. There is a reason why so many field guides are written by retired scientists. It’s not just about expertise, it’s about time too! In early 2016, “A Guide to Mosquitoes of Australia” to was published by CSIRO Publishing and marked the culmination of many years work. This work involved chasing mosquitoes from coastal rock pools to snow melt streams. We carried eskies of buzzing mosquitoes on airplanes from northern Australia to laboratories in Western Sydney and there were many late nights of wrangling those mosquitoes to get the perfect photo. Lots of mosquito bites too. Many, many mosquito bites. Putting together this field guide wasn’t an easy task and for all those involved it proved a challenge in many different ways. Digging out old papers to colour-correcting digital photographs proved time consuming but the biggest delays in finishing this project was a problem that plagues many field guide writer, “species creep”! Completing the guide was only possible with the kindness, generosity and co-operation of many mosquito researchers around the country. Doggett, S.L., Clancy, J., Haniotis, J., Webb C. and Toi, C.
The NSW Arbovirus Surveillance and Vector Monitoring Program acts as an early warning system for arbovirus activity. This is achieved through the monitoring of mosquito abundance, detection of arboviruses from mosquitoes, and the testing for seroconversions to MVEV and KUNV in sentinel chickens. A summary of the last two seasons will be presented. The 2014-2015 season started early with elevated temperatures through late 2014, however conditions were relative dry with neither Forbes’ nor the Nicholls’ hypothesis being suggestive of an MVEV epidemic. Despite this, for the inland region, human notifications were close to average, with 260RRV & 11BFV). There were 12 arboviral detections from the inland including 5BFV, 6RRV & 1STR, with no seroconversions. In contrast, the coastal strip experienced the largest epidemic of RRV in recorded history. The 1,225 cases were close to double the average, with much of the activity occurring in the far north coast. There were 41 isolates from the mosquitoes trapped along the coast and included 6BFV, 29RRV, 4EHV and 2STRV. An intense El Niño occurred during the 2015-2016 season and thus it was extremely dry across the state. Again the Forbes’ and the Nicholls’ hypothesis were not suggestive of an MVEV outbreak. For the inland, mosquito numbers were well below average and there were only two arboviral detections from the mosquitoes (1RRV & 1 BFV), with no seroconversions. Similarly, mosquito collections were below average and there were also two arboviral detections from the trapped mosquitoes (1BFV & 1EHV). Human cases were below average. Are remote piloted aircraft the future of mosquito control in urban wetlands? Mosquito control in urban wetlands will become increasing important. The expansion of residential areas will continue to encroach on natural mosquito habitats, particularly coastal wetlands, and expose the community to the health risks associated with mosquitoes. In many existing areas, ever increasing density of human populations associated with high rise residential developments will further expose people to mosquitoes. The increasing urban development adjacent to wetlands can restrict the ability to use traditional larvicide and insect growth regulator application methods. In 2016 a trial of larvicide application via remote piloted aircraft was undertaken in an area of estuarine wetlands at Sydney Olympic Park. An existing mosquito control program involving helicopter application of larvicides has been in place for over a decade. Post-treatment mortality of Aedes vigilax and Culex sitiens larvae was compared between bioassay and long-term surveillance sites within the wetlands. While there was a substantial reduction in larval densities post-treatment, the treatments via remote piloted aircraft were less effective than those of traditional piloted aircraft. The results of this preliminary trial suggest that the use of remote piloted aircraft has potential but the operational aspects of this application method requires careful consideration if there are to be as effective as existing strategies. There are many gaps to be filled in our understanding of mosquito-borne viruses, their relationships with vectors and reservoir hosts, and the environmental drivers of seasonal activity. Stratford virus (STRV) belongs to the genus Flavivirus and has been isolated from mosquitoes and infected humans in Australia. However, little is known of its vector and reservoir host associations. A total of 43 isolates of STRV from field collected mosquitoes collected in NSW between 1995 and 2013 were examined to determine the genetic diversity between virus isolates and their relationship with mosquito species by year of collection. The virus was isolated from six mosquito species; Aedes aculeatus, Aedes alternans, Aedes notoscriptus, Aedes procax Aedes vigilax, and Anopheles annulipes. While there were distinct differences in temporal and spatial activity of STRV, with peaks of activity in 2006, 2008, 2010 and 2013, there was a high degree of sequence homology (89.1% – 97.7%) found between isolates with no evidence of mosquito species, geographic, or temporal divergence. The result suggests the virus is geographically widespread in NSW (albeit only from coastal regions) and increased local STRV activity is likely to be driven by reservoir host factors and local environmental conditions influencing vector abundance. While STRV may not currently be associated with major outbreaks of human disease, with the potential for urbanisation and climate change to increase mosquito-borne disease risks, and the potential for genomic changes which could produce pathogenic strains, understanding the drivers of STRV activity may assist the development of strategic response to public health risks posed by zoonotic flaviviruses in Australia. Diseases caused by mosquito-borne flaviviruses, including dengue (DENV), Zika and West Nile viruses (WNV), are a global problem. New molecular tools have led to recent discoveries of a plethora of insect-specific flaviviruses (ISF) that infect mosquitoes but not vertebrates. Preliminary reports have suggested that transmission of WNV can be suppressed by some ISFs in co-infected mosquitoes, thus the ecology of ISFs and their potential as natural regulators of flaviviral disease transmission is intriguing. In vitro studies with two ISFs discovered in Australia, Palm Creek virus (PCV) and Parramatta River virus (PaRV), demonstrated suppression of WNV, Murray Valley encephalitis virus (MVEV) and DENV replication in mosquito cells (C6/36) previously infected with either of these ISFs. Further in vivo experiments indicated that these ISFs were not transmitted horizontally in the saliva, and that PaRV relied on vertical transmission through the mosquito egg to the progeny. 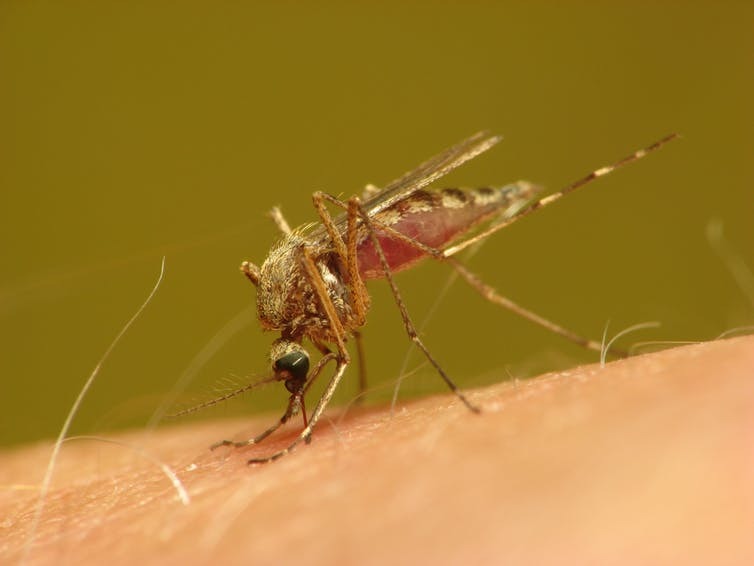 Additional studies revealed a significant reduction of infection and transmission rates of WNV when Culex annulirostris were previously infected with PCV, compared to control groups without PCV. Of particular interest was the specific localisation of ISFs to the midgut epithelium of mosquitoes infected via natural route (vertical transmission – PaRV) or by intrathoracic injection (PCV). Overall these results confirm a role for ISFs in regulating the transmission of pathogenic flaviviruses by mosquitoes and that this interference may occur in the midgut where initial infection occurs. Further research is needed to determine the precise mechanism of this phenomenon and its potential for mosquito-borne disease management. Neges, Nidos and Nings – so that’s what’s killing my mossie cells! Roy Hall1, Jody Hobson-Peters1, Helle Bielefeldt-Ohmann1, Caitlin O’Brien1, Breeanna McLean1, Agathe Colmant1, Jessica Harrison1, Thisun Piyasena1, Natalee Newton1, Waylon Wiseman1, Marcus Mah1,2, Natalie Prow2, Andreas Suhrbier2, David Warrilow3, Andrew van den Hurk3, Sonja Hall-Mendelin3, Cheryl Johansen4, Steven Davis5, Weng Chow6, Stephen Doggett7, John Haniotis7 and Cameron Webb7. 1Australian Infectious Diseases Research Centre, School of Chemistry and Molecular Biosciences, The University of Queensland, Australia; 2QIMR Berghofer Medical Research Institute, Herston, Brisbane, Australia; 3Public Health Virology, Forensic and Scientific Services, Coopers Plains, Queensland, Australia; 4Arbovirus Surveillance and Research, Infectious Diseases Surveillance Unit, PathWest Laboratory Medicine WA, Western Australia; 5Berrimah Veterinary Laboratories, Department of Primary Industry and Fisheries, Darwin, Northern Territory, Australia; 6Vector Surveillance and Control, Australian Army Malaria Institute, Enoggera, Queensland, Australia; 7Department of Medical Entomology, West Westmead Hospital, Westmead, NSW, Australia. Isolation of viruses from mosquitoes is an important component of arbovirus surveillance and virus discovery programs. In our lab, these viruses are detected in inoculated cultures by the appearance of cytopathic effects (CPE) in mosquito cell monolayers or by reactivity of monoclonal antibodies to viral antigens or dsRNA intermediates. Isolates are then identified by RT-PCR or deep sequencing. We detected extensive CPE in many mosquito cell cultures inoculated with mosquito homogenates from several regions of Australia, however these isolates were not identified by specific mAbs or RT-PCRs designed to detect known arboviruses. When we investigated their identity by deep sequencing, a new species (Castlerea virus – CsV) in the unclassified taxon Negevirus, was identified in several mosquito species from WA and Brisbane. Two viruses in the newly established Mesoniviridae family (order Nidovirales) were also identified; a novel species named Casuarina virus (CASV) from Coquillettidia xanthogaster in Darwin and from Culex annulirostris in Cairns, and the first Australian isolates of Nam Dinh virus from several mosquito species in Brisbane and Perth. Many isolates of a new genetic lineage of Liao Ning virus, a member of the Seadornavirus genus (family Reoviridae), were also obtained from several mosquito species from different regions of Australia. These new viruses were isolated at very high frequency in some mosquito collections, and were often found to co-infect isolates of other mosquito-borne viruses making it difficult to obtain pure cultures. We have now developed neutralising antibodies to each virus to facilitate selective removal of these viruses from mixed cultures. That was a busy meeting. I’m exhausted but cannot wait until the next meeting in 2018. Are you a member of the Mosquito Control Association of Australia?